A petition calling for a children’s play park to continue to be named after IRA hunger striker Raymond McCreesh has so far received more than 1,000 signatures of support. It comes after unionists earlier this month criticised the local council for voting to retain the name for the play park in Newry. The Equality Commission also criticised the council for the decision. 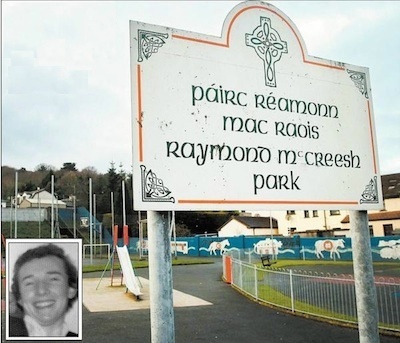 The text of the petition against the renaming of the park reads: “The many who admire Irish freedom fighter Raymond McCreesh have as much right to remember him in this way as those who admire unionist peers, British knights and British kings. Raymond McCreesh, from Camlough in south Armagh, was one of 10 IRA prisoners who died in the hunger strike in 1981 at Long Kesh prison. The third of the IRA Volunteers to join the H-Block hunger strike for political status, he was aged 24 when he died, on May 21st 1981. The play park was originally named after him in 2001 but the council voted in December 2012 to retain the name. Local Sinn Fein assembly member said last month that “the many who admire Irish freedom fighter Raymond McCreesh have as much right to remember him in this way as those who admire unionist peers, British knights and British kings”. He said the request to name this facility Raymond McCreesh Park came from local residents on the 20th anniversary of his death in 2001, and that an official council which found 84% supported it. “Raymond McCreesh was a resident of this district who died on hunger strike in 1981. “He is viewed as a distinguished republican in the area, where I actually grew up, and his sacrifice is remembered and recognised by the people of Newry to this day. “From the naming of the park in 2001 until 2008 there were no issues, complaints or problems raised regarding the park’s name. “In 2008 the Newry District Loyal Orange Lodge, which is not located in the vicinity of the park, made a complaint. “That complaint was investigated by the council and it found, after much deliberation, that the name should be retained. “There are currently numerous instances of council-owned facilities around Newry being named after people of historical note for example Haughey House, Bagnall’s Castle and the Albert Basin area,” said the Sinn Fein representative.